Eltronicschool. - This is one of free PCB design software that called with PCBWEB for Windows System. This software allow user like student and hobbyist can design PCB layout freely. In this moment, we will give you global description about PCBWEB and then we will give you the link to take free download PCBWEB for PCB Design Software for Windows from external or original source. This is freely PCBWEB for PCB Design Software for Windows for you who want to design PCB layout. 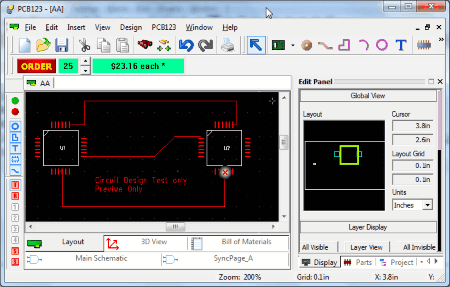 From Listoffreeware blog describe that PCBWeb is a free PCB design software for Windows. It lets you design PCB on your computer and order it online to the manufacturer. Design your circuit with various components, like: Chips, Diodes, Resistors, Transistors, etc. When you create a new file for PCB design, you are asked for Board Name, Board Size, Layers Required, Silk Screen, Material Thickness, etc. A new tab appears on the UI with a blank sheet to design your circuit. Begin adding components from the toolbar (Ctrl+K). A new window opens where you can search or browse for a part to add in the circuit. When you select a component, the window displays the details of that part, like: Manufacturer, Part number, Footprint, Size, Pin count, etc. You may also add footprint of different parts to the PCB, add connections, Shapes, Free style routing, Pin, Cut-outs, and much more. Add text to label parts, pins, connections, etc. The Edit Panel is available on the right side of the UI. At the bottom of the workspace you will find toggle option between Layout, 3D View, main Schematic, etc. View the price of the designed circuit on the top right part of the UI. This circuit design software lets you Save the circuit on your device in .123 format. Print the PCB design if you want. Go to the Help tool for User Guide and Reference Manual. And now you can click the link below to take free download PCBWEB for PCB Design Software for Windows from original source.